Britain's biggest carmaker Jaguar Land Rover slumped to a £90million loss in the three months to 30 September, against a £385million profit a year earlier. Total revenues slipped 10.9 per cent year-on-year to £5.6billion, while retail sales fell 13.2 per cent to 129,887 cars. The car firm, which is owned by Indian group Tata Motors, saw year-on-year retail sales in China plummet over 43 per cent over the period, with the group blaming escalating trade tensions with the US. Dwindling demand for diesel cars, 'uncertainty' surrounding Brexit and new emissions testing certification requirements also took their toll on the group's UK operations, the company said. Earlier this year, the British car builder said it would temporarily reduce production at its plant in Halewood, Merseyside, due to the reduced demand for new cars caused by Brexit, VED increases and diesel surcharges. In April, the company revealed it planned to cut production at its Castle Bromwich and Solihull plants and axe 1,000 temporary workers due to 'continuing headwinds impacting the car industry'. The firm said it was making 'temporary adjustments', with staff at Solihull placed on a three-day week until Christmas. This month, the group said it was also planning a two-week shutdown of its Solihull plant at the end of October, again due to subdued demand. Jaguar Land Rover said employees at the West Midlands plant would be paid for the duration of the shutdown and no jobs would be lost. Jaguar Land Rover's boss, Ralf Speth, said: 'In the latest quarterly period, we continued to see more challenging market conditions. In a bid to revive its fortunes, Jaguar Land Rover used its results to unveil a £2.5billion turnaround plan that includes heavy cost cutting over the next 18 months. The company is cutting planned spending by around £500million to £4billion per year this financial year and next. Commenting on the turnaround plans, Mr Speth said: 'Given these challenges, Jaguar Land Rover has launched far-reaching programmes to deliver cost and cashflow improvements. Professor David Bailey, an expert in the UK's car manufacturing sector at Aston Business School, told This is Money: 'It's something of a prefect storm for JLR. 'Brexit uncertainty, a huge shift away from diesels and now a sharp drop in Chinese sales have together dented JLR's performance. 'It's only the second quarterly loss for JLR in nearly a decade. 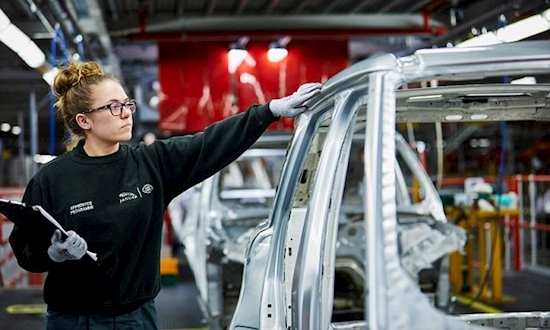 Jaguar Land Rover currently employs around 40,000 staff across the UK. It was the country's biggest car maker in 2017, producing 532,107 vehicles in total. That accounts for almost 32 per cent of all vehicles made in the UK last year.